Your listing equals access to buyers. Each month we print and mail the market’s largest local resource to each state’s buying trade as well as enable their online access to our secure, trade-only shopping and ordering website. We set up each wholesaler based on its unique needs, listing size and order processing operations and preferences. Only retailers and on-premise licensees and their staff that have a password and login can search, view and shop market products and pricing as part of their current subscription. The password-protected site (and in select markets, iOS app) allows on- and off-premise customers easy access to research and shop your products, offering fast and dynamic search, current information on products and pricing, and order management tools. This enables sales teams to better market, manage and serve accounts in new and value-added ways. 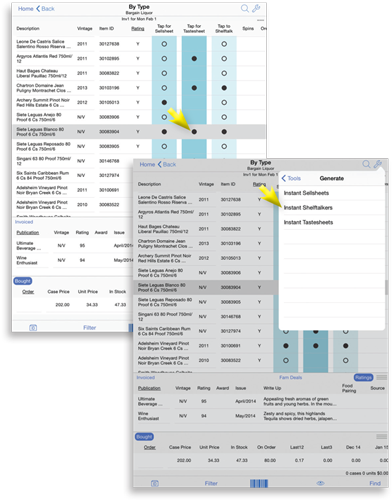 We also support sales teams via Pocket Advantage for iPad and more. Let’s get you started. Get your brands in front of the buyers who matter most to your bottom line. List your wholesale portfolio, pricing and brands in print and online. Thousands of licensees rely on our publications and Search & Order website to search and shop product information and place orders directly to wholesalers. When you list your portfolio and pricing using our platforms, you create a pipeline to licensed buyers and their staff, and can better promote your brands to on- and off-premise accounts. We’ll also provide you with metrics to help you market. Using our proprietary software, our team works with each wholesaler to ensure that prices are posted correctly and expediently. We support weekly or monthly updates and changes to your portfolio. We also provide sales team training on the tools found on our trade site and iOS app to maximize the sale pipeline we provide. Using our proprietary software, our team works with each wholesaler to ensure that prices are posted correctly and expediently. We support weekly or monthly updates and changes to your portfolio. We also provide sales team training on the tools found on our trade site to maximize the sale pipeline we provide. 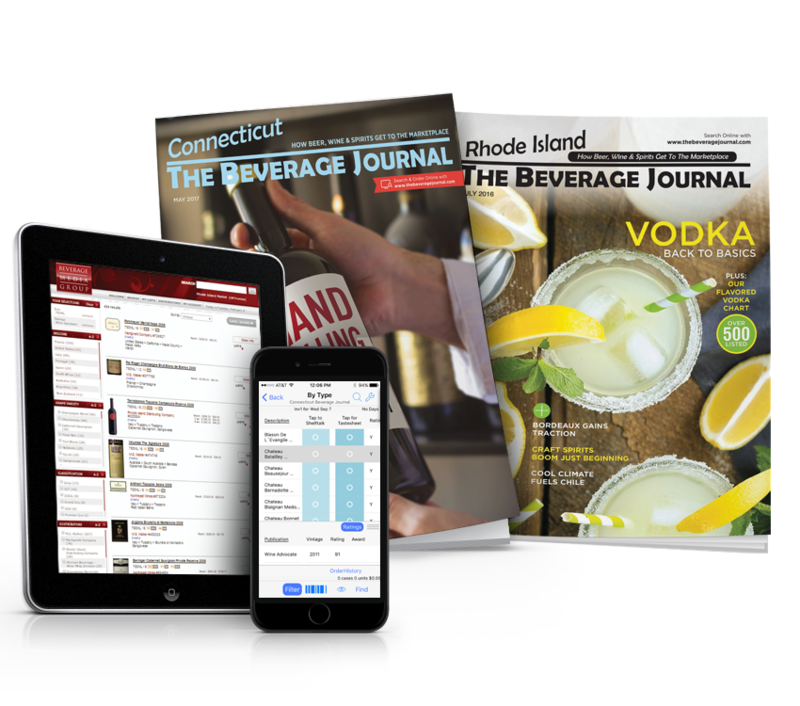 As a partnered wholesaler, your brands will be listed within our state-specific print publications and the online ordering platform, powered by BeverageMedia.com, our network partner. Our combined print, online and IOS platforms offer the most comprehensive market coverage for licenses to shop your brands. With over 10 million searches and $300 million in order volume processed annually between our network Northeast states, it is no surprise that thousands of key buyers are utilizing our platform daily to manage orders, link to sales reps and check availability status. Distributors can also boost sales by giving sales teams the tools to sell smarter and faster. Retailers and on-premise buyers have 24/7 access to place beverage orders online to you from our website and iOS app. Licensees and their beverage-buying staff can search, shop and order beer, wine and spirit products quickly and easily through our local market trade-only product website, and via our app for iPhone, iPad and iPod Touch. Directly to you, in support of your sales process. We also support sales teams via Pocket Advantage for iPad and more. Log on to save time and better understand the choices available to service your own unique customer base. Ask us how to maximize our suite of included tools for your sales team. 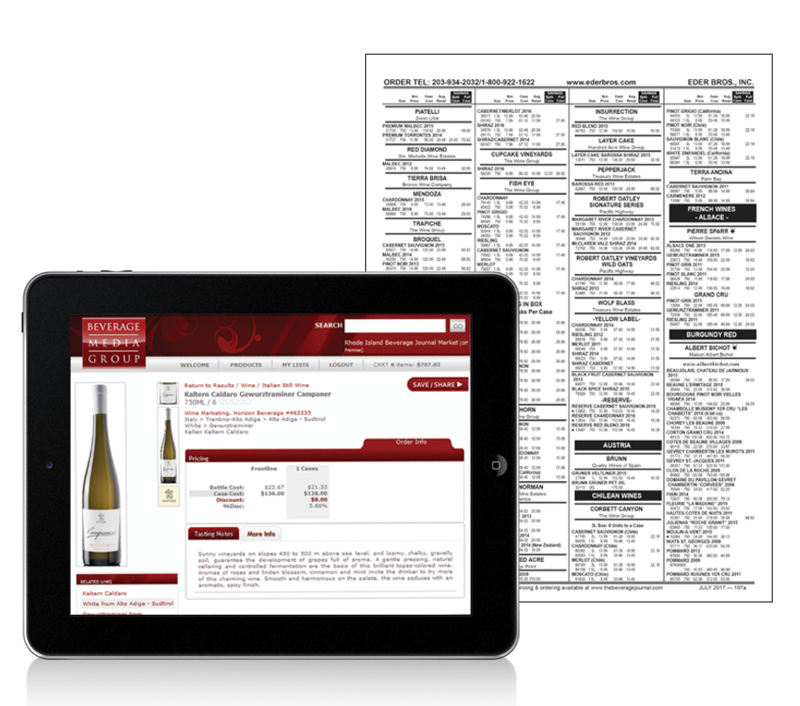 Through our network partner, Beverage Media Group, we also offer Electronic Tear Sheets (ETS) to help manage brand and price information, as well as to enable the typesetting process. We’re here to help. 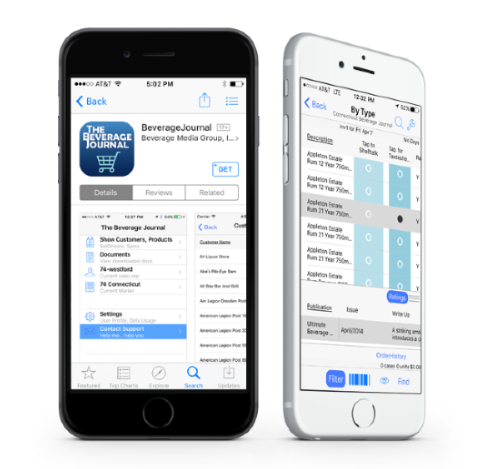 The BeverageJournal iOS app is designed for retailers, bar managers, sommeliers, restaurateurs, suppliers and distributor teams in the beverage alcohol trade to search brand and price information, and place orders with distributors. 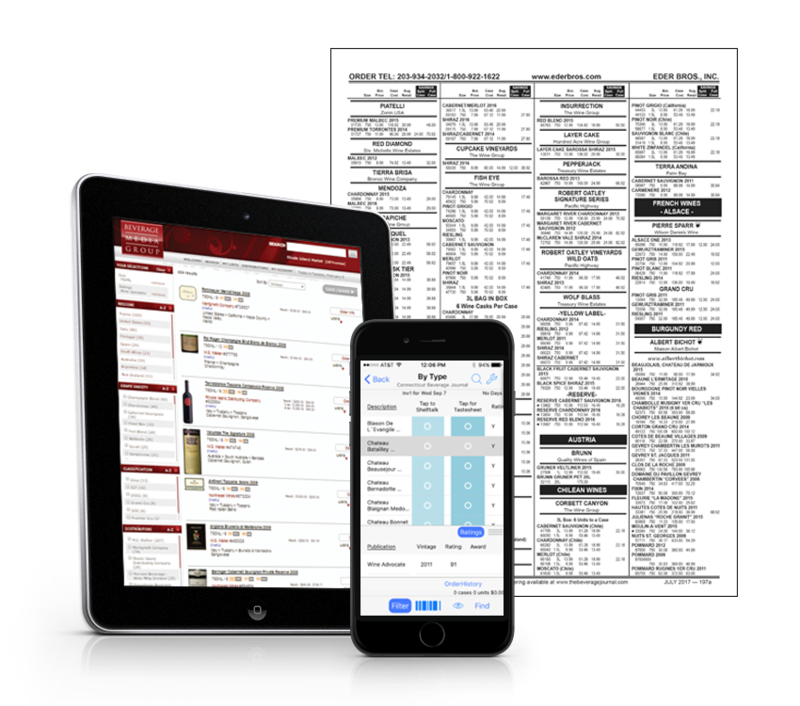 Customized tasting sheets with bottle shots, ratings and pricing information are created with just a few swipes. Custom shelf talker creation tools makes in-store promotion easy and efficient. Suppliers and distributor sales reps can search brand and price information and generate Instant Sell Sheets for their trade customers. Rhode Island’s version will be coming out in 2018. 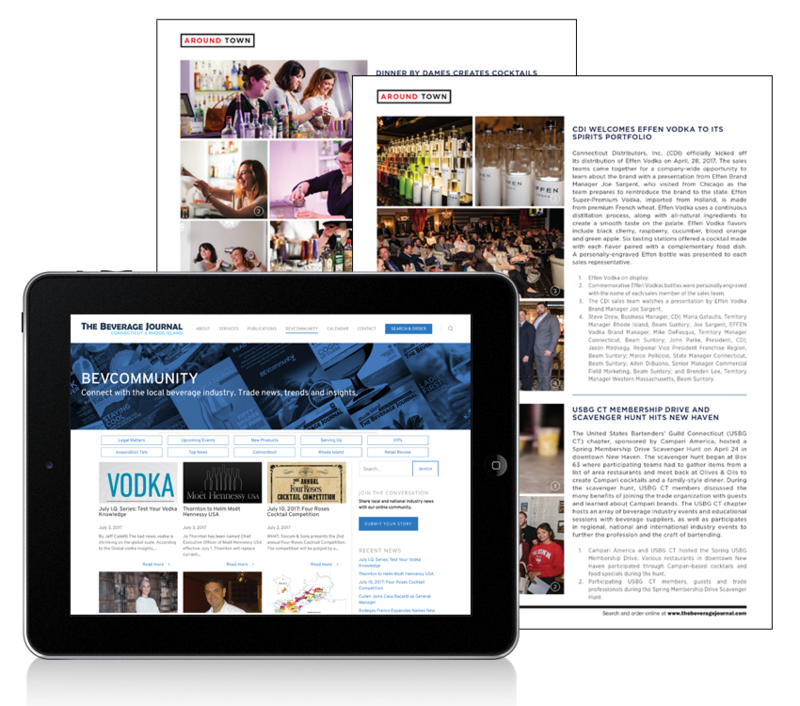 Our technology partners, Beverage Media Group and Inventiv Software, have teamed up to bring wine, spirits and beer distributors, and their sales reps, the most comprehensive selling tools available in the marketplace. By leveraging our extraordinary product library with Inventiv’s premier selling platform, PocketAdvantage, this combination has simplified and streamlined some of the most basic, yet time-consuming functions, empowering sales reps to sell better and smarter. Our Events Calendar connects the trade to local events. For a full listing of upcoming events, click here. To submit your trade event, email the editor.